UOB’s lagging net interest margins (NIMs) are set for an inflection point in the first quarter amid loan growth overseas and re-priced mortgages within Singapore, Maybank KimEng said in a note on Thursday. 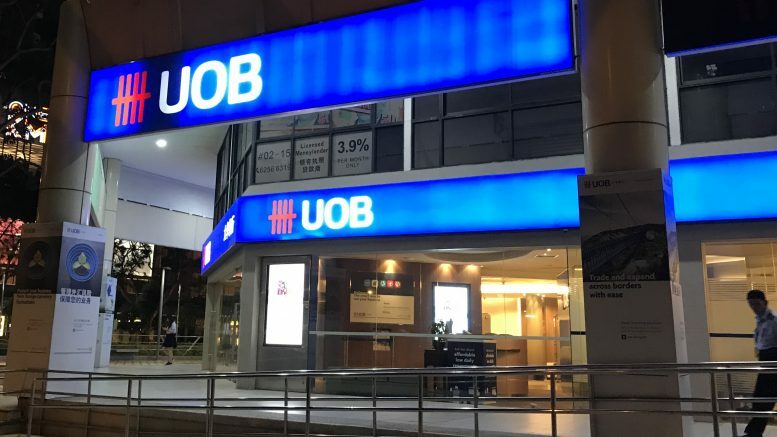 Concerns over weak earnings growth in Singapore have damped UOB’s share price so far this year, the brokerage said, but it added that ignores the bank’s overseas ventures. “By 2020E, for the first time, UOB’s loan book will comprise of more foreign loans than local, we estimate. This will largely be from Southeast Asia and Greater China where growth and NIMs are much higher than developed Singapore,” Maybank KimEng said. Over the past 10 years, profit before tax from overseas has grown at a 9 percent compound annual growth rate (CAGR), compared with only 4 percent for Singapore, the brokerage said. In addition, UOB has been actively repricing its mortgages since late 2018 and improving its liquidity, in part by issuing a US$600 million medium-term note earlier this month, the note said. “As higher asset yields trickle through, we expect to see an inflection point for NIMs in the first quarter of 2019,” Maybank KimEng said, estimating 2019 NIMs would rise by 5 basis points on-year. The brokerage said it expected rising structural overseas earnings and better NIMs would spur a further re-rating for UOB’s shares. It rates the stock at Buy, with a S$29.71 price target. Shares of UOB were up 0.34 percent at S$26.62 at 1:11 P.M. SGT.